完全不推荐当初无做research 买左，好后悔坐好多快车都要比多10欧reserve seat! 完全不推薦 當初無做research 買左，好後悔 坐好多快車都要比多10歐reserve seat! 请注意，Frecce火车需要预订，需要额外支付10欧元。虽然区域列车不需要事先预订。一般来说使用方便。只要记得在你到达时激活它，并确保你写在你的Eurail附带的日记上。 Just take note that Frecce trains need to have a reservation, which cost an additional €10. While the regional trains doesn’t need prior reservations. Generally it was convenient to use. Just remember to have it activated when you arrive and make sure you write on your diary that comes along with your Eurail. 这么方便使用！刚刚验证了米兰中央售票处的通票，我乘火车去了意大利。请务必填写旅行日期和目的地，以方便官员检查。只需为特快列车的预订座位支付额外费用。使用“铁路规划”应用程序来规划我们的火车乘坐。当心火车可能会延误，以确保有足够的时间运输。 So convenient to use! Just validated the pass at Milano Centrale Ticketing Office and I’m off exploring Italy by train. Be sure to fill in the dates of travel and destinations to ease the checking by the officers. Just pay extra for reservation seats for express trains. Used the ‘Rail Planner’ app to plan our train rides. Beware trains may delay so make sure there’s enough time for transit. Eurail只能用于从城市到城市的Trenitalia火车。它不能用于地铁线路和前往机场的特快列车。但是第一堂课非常值得，因为它宽敞，并提供免费无线网络连接和小吃和饮料。 The Eurail can only be used for Trenitalia train from city to city. It can't be used for the Metro Lines and for the express train to the airport. But the first class is very worth it as its spacious and there is free Wi-Fi and snacks and beverages on board. 如果我们在时间之前预先购买了这张票，我们将支付更低的费用（非常显着），因此计算了票价并最终购买意大利的5天票。然而，通行证让我们可以灵活地改变计划，因为我们可以在出发前一天或火车票价格上涨之前预订火车。使用自助售票机很容易预订火车，但请注意我们需要支付10欧元的座位预订，我们在通行证上额外支付了90欧元。注意：我在购买促销时买了票，价格为450美元。我计算了每次旅行费用约25欧元，包括预订费。 Miscalculated the fare and ended up buying the 5days pass for Italy as we will pay lesser (quite significantly) if we prepurchase the ticket well before time. However, the pass gave us the flexibility to have any change of plans as we are able to book the train the day before we depart or just right before where train tickets prices would have gone up. Making reservation for the train was easy using the self service ticket machine, BUT do note that we need to pay EUR10 for seat reservation and we paid additional EUR90 each on top of the pass. NOTE: I bought the tickets when they are having promo, at $450 for 2. I’ve calculated per trip cost about 25EUR including the reservation fees. 不错的旅行和意大利的机票。 Nice trip and ticket for Italy. 完全不建议传球。 esplanade trenitalia公司。这个意大利的eurail通票只能用于火车而不是地铁，地铁，公共汽车。通行证只适用于公司trenitalia而不是其他火车公司。我实际上买了2天的2级通行证。每当你考虑什么时间应该根据火车时刻表离开当天的计划时，大多数情况下只有高速列车可用。最重要的部分是，所有高速列车需要支付每人10欧元的预订座位。无论你想要保留与否，你仍然需要支付10欧元。高速列车最糟糕的部分，它甚至没有放置大行李的地方。所以我买了这么贵的铁路通票，但只能坐当地火车，例如从米兰到维罗纳，高速列车需要1.30小时，如果当地火车将是2-3小时。而且我们并不是真的知道这张传球是一张灵魂通行证，他们要求在你登上火车的那天写日期。由于意大利语英语是限量版，没有一个trenitalia工作人员告诉我们这个问题，所以我们在当地一列火车上每人得到25欧元。我完全不推荐trenitalia，这是我用过的穷人公司，我很遗憾这张票。我真诚地希望Klook可以撤回出售这个意大利的eurail通票，以避免让其他Klook客户失望。不，不要去Trenitalia !!!!!!!!!!!!!!!!!!!!!!!!!!记住我的朋友，对于那些正在考虑这张意大利eurail通行证的人来说，永远不要!!!!!!! is totaly not recommended for the pass. esplanade trenitalia company. this italy eurail pass only can be used in train but not metro, subway, bus. the pass only can sit for company trenitalia but not other train company. I actually bought 2nd class pass for 8 days. Everytime when u consider what time should depart for ur plan of the day accordingly to the train schedule, mostly only the high speed train available. And the most important part was, all high speed train need to pay 10euro per person for a reservation seat. It doesn't matter u want to reserve or not, u still have to pay for 10euro. The high speed train worst part, it do not even have a place to put the big baggage. so i bought such expensive rail pass but only can seat for local train for example from milano to verona with high speed train takes 1.30 hours, if local train will be like 2-3 hours. And we not really know this pass is a flexi pass, they requested to write on the date of the day when u board on train. Because of the italian english is limited edition, no one of the trenitalia crew inform us about this issue, so we got fine 25euro per person in one of the local train. i totally not recommended trenitalia, it was the poor company ever i took, i am so regret with this ticket. 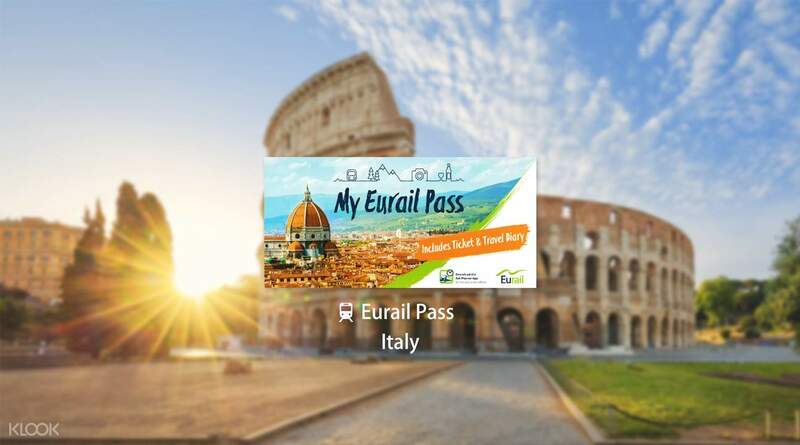 I sincerely hope that Klook can withdraw of selling this italy eurail pass to avoid disappointed other Klook customer. SAY NO and NEVER to Trenitalia !!!!!!!!!!!!!!!!!!!!!!!!!! Remember my friends, for those who are considering this Italy eurail pass, NEVER !!!!!! !